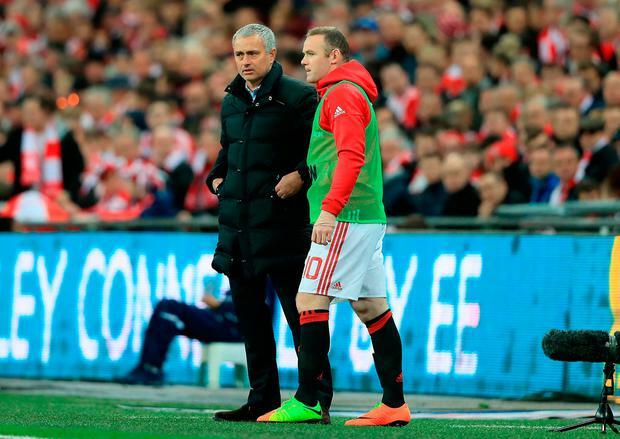 Jose Mourinho had Wayne Rooney and Luke Shaw on his mind yesterday, with the Manchester United manager hoping his captain remains at Old Trafford next season and that the left-back proves his worth. United will look to build on last week's EFL Cup triumph against Southampton when they return to Premier League matters against Bournemouth at lunchtime. Neither Rooney or Shaw managed to get onto the pitch at Wembley but both are in the squad this weekend, with Mourinho clearly keen to get a point across about them in yesterday's press conference. The smiling United boss joked that the England pair's respective futures would dominate the agenda before a question had even been asked, then gave a four-minute monologue about them and last weekend's EFL Cup win. "So Wayne Rooney to Everton," he said, referring to this week's reports. "I only can say that in the final with the result 2-2, with the team in difficulties, with the team possibly going to play 40 more minutes, Rooney was ready to go into the pitch. "So he's not the player that you play in the last minute or give a gift to be in the winning final, it is a player you trust, and you are going to play, probably your crucial change which is the last one. "He is selected for tomorrow with possibilities to play obviously, start or be on the bench and come in. "Since the moment he decided to stay and to help the team and to fight for Manchester United, he's an important player for us. "And I think by giving you these two details, I'm telling you all the talk about Everton for me makes nonsense." Everton have made little secret about their interest in bringing Rooney back to Goodison Park, while last week he rejected Chinese interest in favour of remaining at Old Trafford for the rest of the season. Asked if his skipper would remain at United next season, Mourinho said: "What I got was a very strong message of 'I don't go anywhere', especially China because it was the market that was open until the end of February. "'I don't go anywhere, I want to fight and help this team in everything we are in', so until the end of the season 100 per cent he is with us. "Next season 100 per cent I would like him to be with us, but I don't give you 100 per cent. "I am the kind of manager that likes the players to be happy, not to be with me just because I want them with me." The same goes for top scorer Zlatan Ibrahimovic as speculation continues over his future, but Mourinho sees him "staying with us" despite the veteran striker fuelling speculation after his cup-winning brace. Shaw was not even in the squad against his former club at Wembley, just days after Mourinho said he was now United's fourth-choice left-back. The Portuguese laid down the gauntlet to the 21-year-old and could now reward him with a first Premier League appearance since October, confirming he is in the squad to face Bournemouth. "Luke Shaw, I have good news for you," Mourinho said. "He is selected for tomorrow so you won't need to have the guys at The Lowry to take pictures of who is selected and make the list. "He's in the list for tomorrow, so one step up from not being selected, not being in the final even on the bench. Like Wayne he's selected, so playing or being on the bench, he becomes again an option to us. Luke is working hard, he's trying to improve. "He improved by the physical point of view, I can say, for sure, with good dedication, good specific work and now obviously he needs some opportunities to feel alive, he needs opportunities to play."